I love this place!!!!! Starting with Georganna, she is so sweet! She is so welcoming. I felt so comfortable talking to the staff about my insecurities which I think comes with age. They helped me with frustrating lines on my face that I have been dealing with for years. They didn't judge me, and they were honest with the expectations of what to expect. Christina has a very gentle touch when doing treatments that I could barely feel it. I would never go to another med spa. I highly recommend Aesthetica Med Spa !!!!!! Had a wonderful experience with Christina, she did an amazing job with my Botox and my mom's; will definitely go back again and recommend to all my friends. All the staff were very friendly and Christina is very knowledgeable, great consultation. Clean and relaxing environment. Definitely enjoyed my visit. I went to Aesthetica for the first time about 2 weeks ago for Botox and all I have to say is Christina D. is the absolute BEST! She was very friendly, super knowledgeable, and I'm so happy with the results! She will be my new "go to" girl from now on! After visiting other "discount" spas I went to Aesthetica for Botox. They were friendly and professional. The treatment I received finally addressed those lines between my eyebrows. They really know what they are doing. Plus they have excellent specials. They are my spa for facial treatments from now on. Very professional, knowledgable, and attentive staff. Highly recommend photo facial and Botox for youthful results. Click here to contact Dr. David Sneed and set up a consultation. Harvest/TerumoBCT – PRP for Hair Rejuvenation – PC60 (super concentrated) Patient: 8 months post injection *Patient has recieved a total of 2 PRP treatments since initial photos. Treatments spaced 3 months apart. 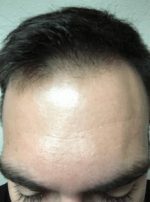 Harvest/TerumoBCT – PRP for Hair Rejuvenation – PC60 (super concentrated) Patient: 14 months post injection *Patient has recieved a total of 2 PRP treatments since initial photos. Treatments spaced 3 months apart.